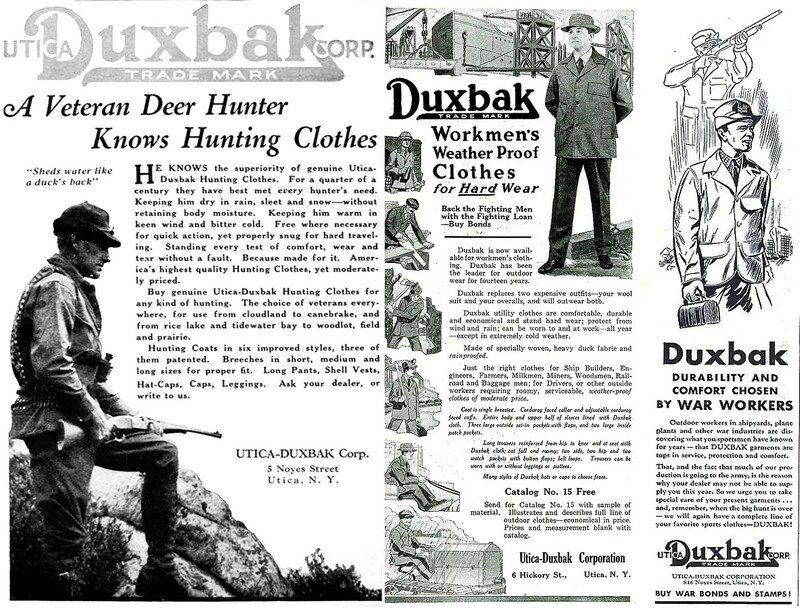 Duxbak of Utica, New York was at one time one of the largest and highest quality manufacturers of hunting garments in the country. The story begins with businessman Quentin McAdam (b.1851, d. 1919). McAdam started with his uncle’s company, Buckingham & Mitchell in 1867. By 1879, he bought out the company and renamed it, Quentin McAdam, wholesale notions. The company went through a series of partnerships and buyouts, becoming McAdam & Hart, then McAdam & Rathbun, then Rathbun & Company after McAdams departure. McAdam founded the Riverside Manufacturing Company of 3-5 Meadow Street, Utica, a manufacturer of “Workingman’s Clothes”, primarily overalls. McAdam sold Riverside to his business partners in 1899 and founded the Utica Knitting Company, which became one of the largest knitting mills in the country. While managing that concern, he was also president of Duxbak for a time. Albert G. Jones (b.1856, d. 1928) started with Buckhingham & Mitchell in 1872, staying with it as a traveling salesman through the various changes in ownership until 1904. McAdam and Jones were among the organizers of the Commercial Travelers’ Accident Association in 1883, McAdam held the number 68 in that organization, Jones held no. 70. Within two years, 100,000 more had joined. Jesse S. Bird had been superintendent at at McAdam’s Riverside Mfg. Co. workwear factory, with years of experience in manufacturing. Bird came up with the Duxbak name, though newspaper reports of how and where vary wildly from telling to telling, but all point to it having to do with their canvas being resistant to the elements like water off a duck’s back. Harry B. Kenyon (b.1870, d. 1940) started with McAdam & Rathbun in 1885 and became a partner in 1893, working alongside Jones and McAdam. In 1903, Jesse Bird, Harry Kenyon and Albert Jones produced their first canvas hunting clothes. The company officially formed in 1904 as Bird, Kenyon & Jones. Their first factory was located at 4 Blandina Street, Utica, New York in the former J.A. Williams building. In addition to manufacturing hunting and outing clothes under the Duxbak and Kamp-It labels, Bird, Kenyon & Jones produced overalls under the Padlock Brand label in their early years. Some later sources claim that Duxbak invented the hunting jacket. This is, of course, false, but they were among the first to produce a high quality version, and innovated many features which came to define the style. They used a fine grade of canvas which had been Cravenette processed for water repellency. They were also early producers of what they called, “outing clothing”, which would spawn an entire industry of purpose-built hiking and camping clothing. Early campers and hikers in the Adirondack region would simply wear an old set of clothes or suit in their outdoor pursuits. Duxbak saw the need for specialty outdoor wear and introduced their Kamp-It brand, which included an extensive lineup for women. By 1908, Bird, Kenyon & Jones had outgrown their factory and expanded to the old Utica Casket Co. warehouse, located at 5 Hickory Street (later renamed to Noyes St.) The three story building had been moved to that site years earlier in three sections by canal from a location out of town. In December of 1916, Jones bought out his business partners and reorganized under the name Utica Duxbak Corp. From this point on, it was a true family business, upon reorganization, the officers were, Ralph McAdam Jones, president; Wardwell Willoughby Jones, vice president; Albert Grosh Jones, treasurer and general manager; and Carlton Bucher Jones, secretary and assistant treasurer. 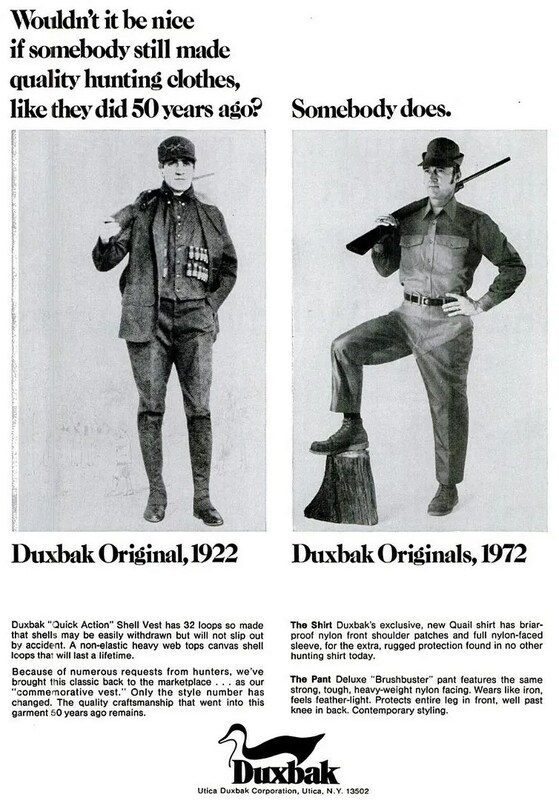 In the decades that followed, Duxbak expanded their line to include wool hunting gear, produced under the Utica label, with fabric sourced from the Newton Woolen Mills of Homer, New York. Company literature claims they were the first to add leather reinforcement to hunting pants as protection against brush and brambles. They were also supposedly the first to introduce camouflage hunting gear. Duxbak released a number of fabrics for and sub-lines of their coats over the years, including, “Mohawk”, “Montana Cloth”, “Sahib Poplin”, “Caprolan Nylon”, “Mains’le Cloth” and “Bobcat”. 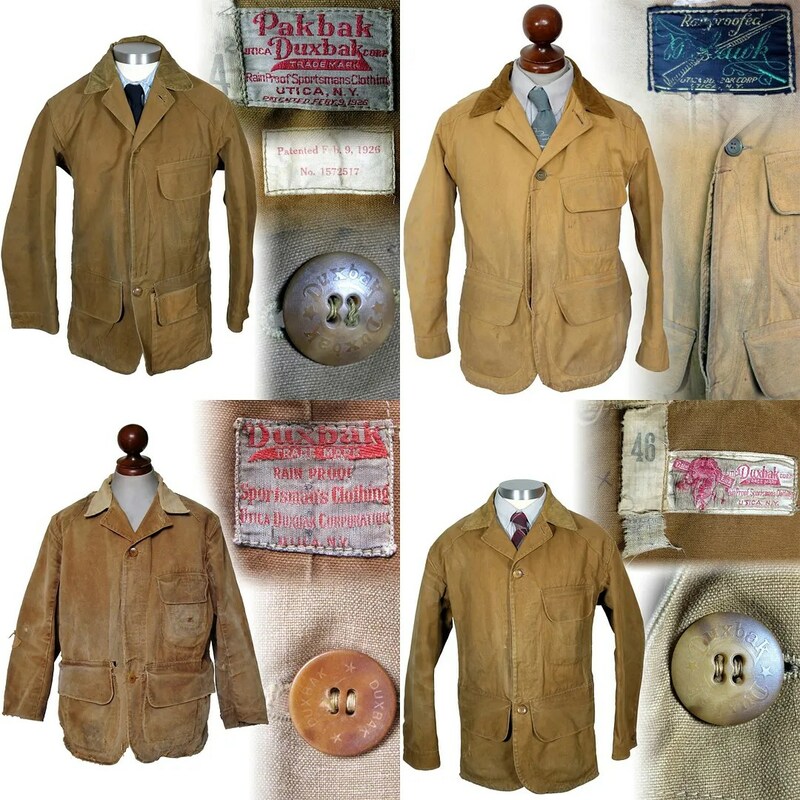 During WWII, Duxbak contracted to the Army, but heavily promoted their existing hunting coats as workwear for shipbuilders and workers in airplane plants. Their hunting coat and hat wearing duck mascot was introduced c.1954 and the stylized duck logo was introduced in 1969 and used through to their closure. Their own quality may have contributed to their downfall. The heavy canvas and overengineered workmanship of Duxbak coats means they survived decades of heavy usage. In the 1920s and 1930s, Duxbak would advertise their product by hanging heavily worn examples from their earliest days in their display window; coats and vests which had outlived their original owners and were still in serviceable condition. In my vintage dealing, I regularly find Duxbak products from the 1920s with hunting licenses or objects in the pockets dating from the 1950s or 1960s. With no fashion world to contend with, Duxbak coats were passed down generation to generation. They advertised themselves with pride as not just as the makers of the highest quality hunting gear on the market, but also the most expensive. Japanese and Korean made canvas hunting clothes flooded the market starting in the 1960s. Generally, it was made from thin canvas with simple details and was sold at a low price. Many US based canvas hunting clothes makers struggled to compete. Duxbak remained a family owned business for over 80 years, with 3rd generation Gilbert Jones at the helm beginning in 1958. In 1986, facing serious financial problems, Duxbak sold to Holland Apparel of Fitzgerald, Georgia. The company had shrunk to 60 employees by the time the Utica concern was closed, with 35 in manufacturing and 25 in the offices and warehouse. Walls Industries of Texas bought the Duxbak brand name somewhere between 1990 and 1993 and continued production, with Cabelas as a major distributor. Walls was purchased by Williamson Dickie Holding, owners of Dickies workwear, in 2013. In time for the 100th anniversary of the company, Williamson Dickie quietly discontinued the brand without public announcement. by Spencer Stewart/ Vintage Haberdashers. All rights reserved. This entry was posted in Uncategorized and tagged a guide to dating duxbax, canvas, duxbak, history, hunting coat, Utica Duxbak, when was my duxbak coat made by Spencer Stewart. Bookmark the permalink. I have been looking for Duxbak hats for a long time. Didn’t know what happened to the company, thanks for the article. Hi Spencer, I have a set of Duxbak gaitors/spats with a label unlike any above. I always thought they were military but have since learned they are likely hunting gear. They are in really good shape — dry cleaned and put away hanging, but only partial laces. How would I find out the possible value and age of this item?